Check whether the issuer (1) filed all reports required to be filed by Section 13 or 15(d) of the Exchange Act during the past 12 months (or for such shorter period that the registrant was required to file such reports), and (2) has been subject to such filing requirements for the past 90 days. Yes [X] No [ ]. Check whether the registrant filed all documents and reports required to be filed by Section 12, 13 or 15(d) of the Exchange Act after the distribution of securities under a plan confirmed by a court. Yes [ ] No [ ]. Not applicable. As of August 13, 2004 there were 9,281,301 shares of the issuer's Common Stock outstanding. Transitional Small Business Disclosure Format (Check one): Yes [ ] No [X]. 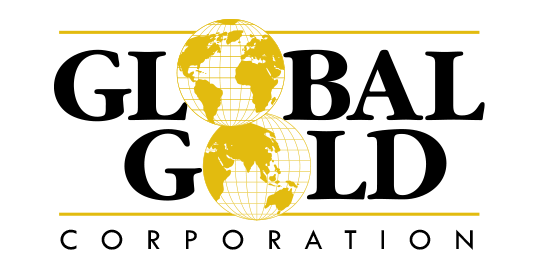 Global Gold Corporation (the "Company") is currently in the development stage. Effective March 30, 2004, the Company was approved for trading on the OTC BB, with the trading symbol GBGD. The Company was incorporated as Triad Energy Corporation in the State of Delaware on February 21, 1980 and conducted other business prior to its re-entry into the development stage on January 1,1995. During 1995, the Company changed its name from Triad Energy Corporation toGlobal Gold Corporation to pursue certain gold and copper mining rights in theformer Soviet Republics of Armenia and Georgia. The Company was previously engaged in the development of a gold mining project in Armenia, and had pursued various mining and other business opportunities thereafter, but without any such transactions. In September 2002, the Company entered into negotiation to acquire a mining property in Chile. The Company, on January 15, 2003, entered into an option/purchase/lease agreement with Alfredo Soto Torino and Adrian Soto Torino for the purchase of copper gold properties in Chile (the Candelaria 1 to 3, the Santa Candelaria 1 to 8 and the Torino I mining claims 1 through 7 and Torino II mining claims 1 through 11) Chanaral District III (the "Chilean Agreement"). The Agreement was converted into a purchase Agreement on February 4, 2004, when the transfer was closed. In addition to the Chilean Agreement, in 2003, the Company has entered into agreements with two companies in Armenia, a member of the Commonwealth of Independent States. These agreements are with SHA, LLC for the acquisition of the Hankavan and Marjan mines (a transaction which was closed on December 21, 2003) and a "Purchase Deposit Agreement" on January 20, 2004 with Sipan I LLC, an Armenian company, for the purchase of the Litchvadz-Tei and Terterasar gold properties and associated processing plant and related assets in southern Armenia. On May 21, 2004, the date to conclude the share purchase agreement for this acquisition, was extended to June 30, 2004 and on July 19, 2004 it was extended again to September 1, 2004. On January 24, 2003, the Company incorporated Global Oro LLC and Global Plata LLC, as wholly owned subsidiaries, in the State of Delaware. The companies were formed to be equal joint owners of a Chilean Limited Liability Company, not formed as of June 30, 2004, for the purpose of owning the Santa Candelaria Project. Neither company had any assets or liabilities as of June 30, 2004. On August 18, 2003, the Company incorporated Global Gold Armenia LLC and Global Gold Mining LLC, as wholly owned subsidiaries, in the State of Delaware. Global Gold Armenia LLC was formed to own Global Gold Mining LLC which owns SHA LLC (which holds the licenses to the Hankavan and Marjan mines)and is intended to own SIPAN I LLC (which owns the licenses and property known as the Litchvadz-Tei and Terterasar mines as well as the associated processing plant)(SIPAN I LLC). On May 27, 2004, the Company signed a financing and acquisition agreement with Melrose Metals & Minerals Limited of Perth, Australia (Melrose). As of August 13, 2004, Melrose has failed to perform its obligations and funding under the agreement.The Company is reviewing its options in consultation with Melrose. These financial statements have been prepared assuming that the Company will continue as a going concern. Since its inception, the Company, a development stage enterprise, has yet to generate revenues (other than interest income, proceeds from the sale of an interest in an Armenian mining venture, and the sale of marketable securities (consisting of common stock) received as consideration therewith) while incurring net costs in excess of $2,963,000. Management is currently pursuing additional investors and lending institutions interested in financing the Company's projects. However, there is no assurance that the Company will obtain the financing that it requires or achieve profitable operations. The Company expects to incur additional losses for the near term until such time as it derives substantial revenues from the Chilean mining interest acquired by it or other future projects. The accompanying financial statements do not include any adjustments that may be necessary should the Company be unable to continue as a going concern. The Company entered into Amended and Restated Employment Agreements with Messrs. Gallagher and Garrison and an initial Employment Agreement with Van Krikorian dated as of February 1, 2003 through June 30, 2006. The Employment Agreements provided for base compensation of $100,000 for each twelve-month period (subject to payment as cash flow permits), and the granting of 900,000 shares as a restricted stock award subject to a substantial risk of forfeiture if any employee terminates his employment with the Company (other than by death or disability) over the term of the agreement, and which is to be earned, and vest ratably, during such period. Mr. Garrison resigned as of June 30, 2004. Under applicable provision of Mr. Garrison's Amended and Restated Employment Agreement he became vested in 373,167 shares out of the 900,000 shares of common stock awarded to him on a forfeitable basis, and forfeited 526,833 shares of such stock. In addition, the unpaid amount of $100,000.00 of his base compensation for the 12-month period ended June 30, 2004 will become due and payable on June 30, 2005. Mr.Garrison will serve as a director through December 31, 2004. On March 17, 2004 the Company issued 50,000 shares at the fair market value of $0.50 per share as determined by the Board of Directors to each of its five directors, Messrs. Aynilian, Gallagher, Garrison, Mason and Krikorian (for a total share issuance of 250,000 shares)as compensation for their service on the Board in 2004. Such amounts have been reflected as unearned compensation and are being amortized as compensation expense on a straight-line basis over the term of the agreements. Compensation expense for the six-months ended June 30, 2004 is $62,500. During the six months ended June 30, 2004, the Company sold 400,000 shares of common stock of Sterlite Gold Ltd. for net proceeds of $34,879 resulting in a gain on the sale of $8,747. The Company had deferred tax assets of approximately $1,059,000 at June 30, 2004. The Company established a valuation allowance for the full amount of such deferred tax assets at June 30, 2004, as management of the Company is unable to determine that it is more likely than not that the deferred tax assets will be realized. Additionally, the limitations of Section 382 of the Internal Revenue Code would further impair the utilization of a net operating loss deduction. The net operating loss carryforward at June 30, 2004, was approximately $2,859,000 expires in the years 2004 to 2024. On May 27, 2004, the Company signed a financing and acquisition agreement with Melrose Metals & Minerals Limited of Perth, Australia (Melrose). The agreement provides for a staged financing of both the Company and Global Gold Mining, LLC, which includes the rights in the Hankavan and Marjan mining properties as well as the option on the Litchkvadz-Tei and Terterasar mines in Armenia. As of August 13, 2004, Melrose has failed to perform its obligations and funding under the agreement. The Company is reviewing its options in consultation with Melrose. When used in this discussion, the words "expect(s)", "feel(s)", "believe(s)", "will", "may", "anticipate(s)" and similar expressions are intended to identify forward-looking statements. Such statements are subject to certain risks and uncertainties, which could cause actual results to differ materially from those projected. Readers are cautioned not to place undue reliance on these forward-looking statements, and are urged to carefully review and consider the various disclosures elsewhere in this Form 10-QSB. During the six-month period ended June 30, 2004, the Company's administrative and other expenses were $405,363 which represented an increase of $305,029 from $100,334 in the same period last year. The expense increase was primarily attributable to higher compensation expense of $314,842, exploration expenses of $30,905, accounting fees of $47,950, and higher travel expenses of $20,828 due to increased activity resulting from project development in Armenia and Chile. As of June 30, 2004, the Company's total assets were $412,331, of which $6,879 consisted of cash or cash equivalents. (d) Pursue additional financing through private placements or joint ventures. The Company retains the right until December 31, 2009 to elect to participate at a level of up to twenty percent with Sterlite Gold Ltd. or any of its affiliates in any exploration project undertaken in Armenia. The Company needs financing to meet its anticipated monthly administrative expenses of about $20,000 (exclusive of accrued officers' compensation), plus additional amounts for legal and accounting costs. The Company anticipates that it might obtain additional financing from the holders of its Warrants to purchase 330,000 shares of Common Stock of the Company at an exercise price of $0.25 per share, which expire on October 31, 2005. If the Warrants were exercised in full, the Company would receive $82,500 in gross proceeds. However, the Company does not believe that the Warrants will be exercised under existing circumstances, and thus it does not anticipate that any amount thereof will be exercised. In the event that no contemplated financing is obtained through the exercise of the Warrants (which the Company considers highly remote) or through its current financing plans, the Company does not have sufficient financial resources to meet its obligations. The Company does not intend to engage in any research and development during 2004 and does not expect to purchase or sell any plant or significant equipment. We have continued losses in each of our years of operation, negative cash flow and liquidity problems. Employee salaries are not being paid. These conditions raise substantial doubt about our ability to continue as a going concern. The accompanying condensed financial statements do not include any adjustments relating to the recoverability of reported assets or liabilities should we be unable to continue as a going concern. We have been able to continue based upon our receipt of funds from the issuance of equity securities and shareholder loans, and by acquiring assets or paying expenses by issuing stock. Our continued existence is dependent upon our continued ability to raise funds through the issuance of our securities or borrowings, and our ability to acquire assets or satisfy liabilities by the issuance of stock. Management's plans in this regard are to obtain other debt and equity financing until profitable operation and positive cash flow are achieved and maintained. Although management believes that it will be able to secure suitable additional financing for the Company's operations, there can be no guarantee that such financing will continue to be available on reasonable terms, or at all. As of the end of the period covered by this report, an evaluation was carried out under the supervision and with the participation of the Company's Chief Executive Officer and Chief Financial Officer of the effectiveness of our disclosure controls and procedures (as defined in Rules 13a-14 and 15d-14 under the Securities Exchange Act of 1934). Based on that evaluation, the Chief Executive Officer and Chief Financial Officer have concluded that the Company's disclosure controls and procedures are effective to ensure that information required to be disclosed by the Company in reports that it files or submits under the Securities Exchange Act of 1934 is recorded, processed, summarized and reported within the time periods specified in Securities and Exchange Commission rules and forms. Subsequent to the date of their evaluation, there were no significant changes in the Company internal controls or in other factors that could significantly affect the disclosure controls, including any corrective actions with regard to significant deficiencies and material weaknesses. Board in 2004. Mr. Garrison resigned as of June 30, 2004. Under applicable provision of Mr. Garrison's Amended and Restated Employment Agreement he became vested in 373,167 shares out of the 900,000 shares of common stock awarded to him on a forfeitable basis, and forfeited 526,833 shares of such stock. o Statements of Operations and Statements of Cash Flows for the three-months ended June 30, 2004 and June 30, 2003, and for the six-months ended June 30, 2004 and June 30, 2003 and for the development stage period from January 1, 1995 through June 30, 2004 and the Exhibits which are listed on the Exhibit Index. Current Report on Form 8-K, filed with the Securities and Exchange Commission on September 23, 2003, under Item 4 of Form 8-K.